It was disappointing news today in Rafa’s press conference that Isaac Hayden is out for four weeks after having surgery on his injured ankle. But on the other hand he’s been playing through the pain barrier for too long so to have the surgery is good. It’s a chronic injury so it needs to be fixed if at all possible so it doesn’t keep recurring – hopefully the surgery will do that. Who said Jack wasn’t a creative player! Jack may also be able to raise his game as he gets more games, but Isaac is our top man alongside Jonjo Shelvey these days – and the team plays well when Isaac plays. The 21 year-old has been terrific for us this season and he will be a miss. The good news is that Vurnon Anita is back in training today and that’s just one day short of five weeks since he was injured at Brentford. That’s a quick recovery after the initial prognosis was that he could be out for over two months, as first reported by the Times’ George Caulkin. That’s very good news for Newcastle, because Vurnon can play at right back but he is a central midfielder who could possibly partner Jonjo Shelvey. Vurnon has played really well for Rafa Benitez and the manager has great confidence in him, because of his experience as a player and he follows Rafa’s directions to the letter. So it could be good that Vurnon is back in training again, although we expect Jack to play against Aston Villa on Monday night. 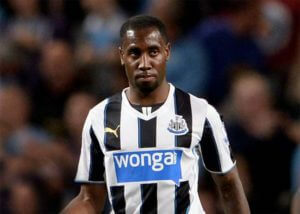 Maybe Vurnon could be considered for the home game against Bristol City a week tomorrow? Mo Diame could also play in defensive midfield, but he’s too good moving forward on those powerful runs to play simply as a defensive midfielder. The Chronicle are reporting that Chancel Mbemba could play in place of Hayden since that’s where he played for DR Congo in the African Cup of Nations so that’s an interesting possibility. Chancel has had a tough season at Newcastle and maybe he could do a job for us alongside Jonjo – no doubt Rafa will see how he does in training, since Chancel now seems to be fourth choice at center-back at the moment. Hayden a big miss especially with our upcoming schedule. Better in every department than Colback, perhaps aside from winning fouls, but then Colback balances that out with the fouls he so cheaply and unnecessarily gives away. Sorry to hear about your latest health update diagnosis Ed, I’d just like to wish all the very best, as a cancer survivor myself going on for 18 years now since my first diagnosis. Keep on fighting it Ed we are all behind you mate.